A miracle is needed for two dogs, who sadly, right now, don't even resemble what a dog should look like. It's a heartbreaking situation. The pair is being held by the City of Rosebud, Texas and unless someone comes forward to help them they will be euthanized on Wednesday, August 27th. And when you read the rest of this story, and see these pictures, you may be stunned. It all started last week when a concerned Rosebud resident posted this video on Facebook showing two dogs with severe mange, eating food out of some sort of metal contraption. The post said, "My neighbors dogs that the city won't do anything about ... They need to be removed and cared for, but Rosebud has no animal control. If it's the last thing I do I'm going to find someone to help." The video has been shared hundreds of times and posters lit up the comment section with concern. Tipsters messaged Watchdog Mary, who contacted Rosebud officials. Within an hour of reaching out, City Administrator Keith Whitfield called back. He told WatchDog Mary the police were going to pick up the dogs and bring them to a vet for an evaluation. Whitfield said the dogs' owner was cooperating, the animals appeared well fed and the pair was surrendered to the city. A vet evaluated the dogs and diagnosed them with a contagious form of mange, it's very treatable, but the animals will be contagious for a couple of weeks. That created one challenge, whomever adopts or rescues these dogs will need to keep them away from other dogs while they're being treated. The dogs are still in the city custody. If they are not adopted by Wednesday the dogs will be put to sleep. By our policy we have kept them longer than we are suppose to and again if they are not adopted by 8/27/14 they will be put to sleep. The dogs need treatment to overcome the problem and the city nor the previous owner is not in a position to treat them. We have had several people contact us about the dogs but when they find out the status they are not able to take them. If you have anyone that may take them please contact me by 8/27/14. What happened to the dog's owner? Will the person face charges for this? This is exactly what Lee wrote in his statement to WatchDog Mary, "In the Penal Code of Texas state that it's only animal cruelty if the owner is not providing shelter and food for the dog. The dogs are not malnutrition nor were they starving when we went there the vet report stated that the dogs were in good health and were starving they have had food every time my officers and myself have been by the resident." Neither Lee nor Whitfield answered WatchDog Mary's questions asking if the City has done anything to find the dogs help, like reaching out to rescue groups, potential foster homes or adopters. Lee would only say, "This city is not liable to continue to keep these dogs if you know someone that is willing to take the dogs please let us know if not Wednesday of next week the dogs will be put down." At the urging of WatchDog Mary, Rosebud officials finally took these pictures of the dogs, deplorable looking, but curable and posted them on their Facebook site. WatchDog Mary spoke to the vet's office which evaluated the dogs. They say the dogs are mixed breed, they aren't sure what kind, their hair loss is treatable and they would make wonderful pets. The dogs are young, probably 1-2 years old and there is one male and one female dog. The neighbor who took the video of the dogs and exposed the situation, but does not to reveal her name, says, "They just looked mixed (breed) to me. They were always nice to me and my kids they also seemed nice to the other animals in the yard. Just always very sweet. They might be some kind of heeler mix. Not certain. I don't think they would show aggression towards other dogs." If you're interested in trying to help these dogs, please contact Rosebud City Hall at 254-583-7926. Right now it appears it's WatchDog Mary's job to find a solution for these dogs and she is asking for your help. If you can please share this article, reach out to a rescue group, or anyone you know who may be able to foster or adopt these dogs, it could save their lives. An anonymous donor contacted WatchDog Mary and offered to give the $100 or so the dog's mange medication will cost if someone rescues these dogs. If you are interested in making a pledge to donate to the animal rescue or adopter who agrees to take the dogs, get them treatment and eventually adopted, please message WatchDog Mary through the links below. If you care to contact Police Chief Quincy Lee, policechief@rosebudtexas.us is his email. City administrator, Keith Whitfield can also be reached via email cityadministrator@rosebudtexas.us here. Lee says when stray dogs are picked up in they're taken to the City's pound. If no one claims an animal within 72 hours they are euthanized. Rosebud, which is a small city Northeast of Austin and South of Waco, has no adoption program, nor does it work with shelters to find dogs homes. Watchdog Mary is a new site designated to helping animals and revealing questionable circumstances in shelters across the United States. If you have a tip please let us know, message the WatchDog Mary Facebook page, or send an email. 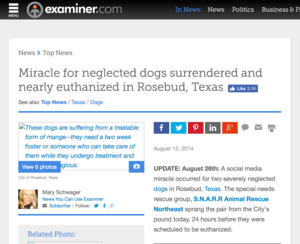 UPDATE: August 26th: A social media miracle occurred for two severely neglected dogs in Rosebud, Texas. The special needs rescue group, S.N.A.R.R Animal Rescue Northeast sprang the pair from the City's pound today, 24 hours before they were scheduled to be euthanized. The two dogs, which will be renamed, "Rose and "Bud" are now at a veterinarians office receiving treatment for mange, getting a complete check up, and as S.N.A.R.R's Kristina Howley puts it being, "pampered." The group saw this article and wasted no time contacting the Rosebud Police. The chief called them back right away and they formulated a plan for the dogs. The rescue group welcomes donations to help pay for the pooches' treatment, transport out of Texas and continued care until they are healthy enough to be adopted. "Every little bit helps and this brother and sister will have to spend some time in the hospital before they can get a health certificate to clear them for transport to NY," said Howley. If you'd like to donate, go to S.N.A.R.R's website www.snarrnortheast.org. Howley's message to Watchdog Mary , "Thanks again for bringing so much awareness to these dogs. If it wasn't for your article they would likely be PTS (put to sleep)." And WatchDog Mary's message to everyone: Thank you for sharing this article. You saved these dog's lives! UPDATE: The dogs are healing up and looking great. Check out the before and after pics!